The best advice we can give you about removing spots is: don’t try it yourself. 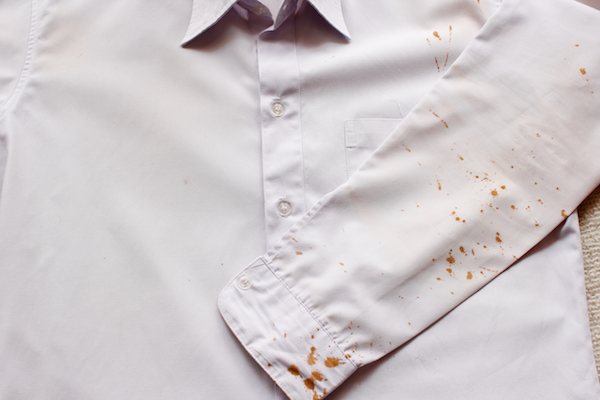 Rubbing spots with a wet napkin can remove color and set the stain. Home remedies like club soda and hair spray usually only make matters worse. Bring your spotted garments to us instead. Our spotters, with decades of experience, know the correct chemicals and methods to remove spots safely. Cotton and cotton/polyester shirts will shrink over their lifetime. 1% to 3% shrinkage is normal according to the cotton industry. One half inch in the collar and one inch in the sleeve length represents 3% shrinkage. To extend the life of your garment Highland recommends purchasing dress shirts slightly larger than needed to anticipate the inevitable.